The pilgrimage to the Three Maries in France will not take place in 2019. I cannot promise that it will take place the following year either. I did not realise that taking a group on pilgrimage will be such a big undertaking. I have always taken friends and family on pilgrimage previously and therefore it was a much more casual affair. However, taking a group of strangers means a much more formal arrangement and contracts and I therefore decided to get a guide and a travel agent, but that made the costs sky rocket. I have been waiting on inner guidance and finally received it very clearly : I am to focus on the research and creation of the Black Madonna deck. So dear ones, that is what I will do. 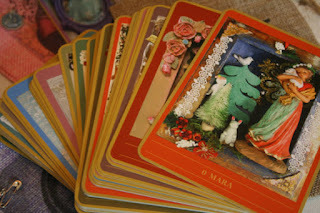 I have already with the creation of the Mysteries of Mary tarot deck learnt that it is a huge undertaking that it demands diving deeply into the Otherworlds in order to return with the insight and understanding necessary to put the deck together; and then there is still the actual crafting of the deck. I will share my journey with you. I will leave the itinerary up here for those who would like to undertake this pilgrimage on their own. in the Mysteries of Mary Tarot Deck. access to plus new sites that I have not visited either, so I am also excited. All travelling will be done in the comfort of an 8 seater minibus. We will meet in Marseilles on Thursday 23 May. The city was founded by the Phoenicians 2600 years ago and it is the oldest city in France. and one of the highlights of visiting Notre Dame de Confession. There are those who believe that this Black Madonna is indeed Mary Magdalene. According to an obscure French alchemists’ website, Our Lady the Green One is an old title of Our Lady of the Confession. Normally I wouldn’t pay this much heed, but she certainly has a close relationship to the color green and she has another old title, which has fallen out of use. Ean Begg mentions it as: Our Lady of the Fennel or Our Lady of New Fire. “Our Lady of the Fennel” is actually a misunderstanding of the old Provence dialect words ‘fue nou’ or ‘fuech noou’. They mean ‘new fire’, not ‘fennel’ or ‘fenouil’ in modern French. 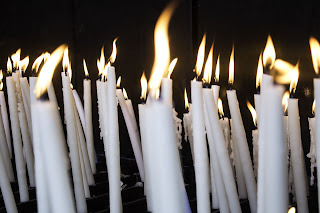 She was long called Our Lady of the New Fire, because on her feast day, Candlemas, the new fire for the candles was blessed, just like nowadays the new Easter fire for the Easter candle is blessed during the Easter vigil. People would then bring fresh wicks and oil lamps and take some of this “new fire” home. This old rite of blessing a fire connected with Mary (as well as one connected with Jesus) probably survived longer at St. Victor’s church than anywhere else.] It still echoes to this day in the green candles, which the faithful buy at the church on Candlemas to offer there and also take home. What about the title the Green One? The easy explanation for it would be that she wears a green mantle, not so easily made out normally, because the colors are faded. 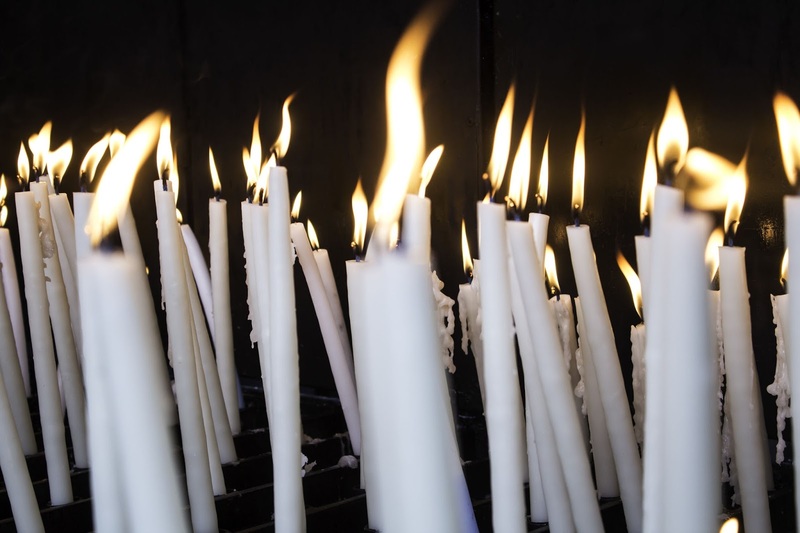 However on her feast day, Candlemas, on February 2nd, her wooden green mantel is overlaid with a green cloth over coat and green candles are burnt and blessed in her honor. Late afternoon we will drive to the seaside town of Saintes Maries de la Mer where legend has it that the small boat without sail or oars, carrying the three Marys landed. 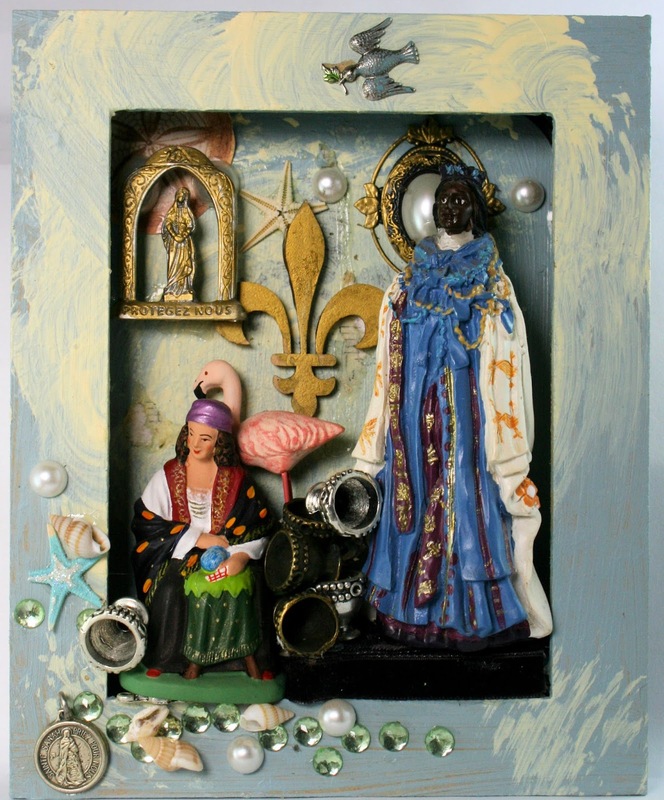 Here Sante Sara, the black madonna of the Rom Gypsies, miraculously covered the ocean with her cloak and the women could disembark. We will drive through the landscape of the Camargue, its salted marshes with white sands, wild horses and coral flamingoes. Annually hundreds of pilgrims arrive in the small town and for a week there are festivities, celebrations and wonderful religious processions carrying Sante Sara and the two Marys into the ocean. market, the wonderful food of this specific region, the daily opening of the town with the running of the white horses of the Camargue and to participate in the two main events of the pilgrimage : the two processions on consecutive days of carrying the two Marys and Sante Sara into the ocean. Similar to the Hindu traditions of Durga Ma, the water is blessed by the saint's immersion into the water and many pilgrims follow her into the waves. We will enjoy lunch at a local restaurant facing the Mediterranean sea and you will have enough personal free time to scavenge the markets and the choice of dinners. 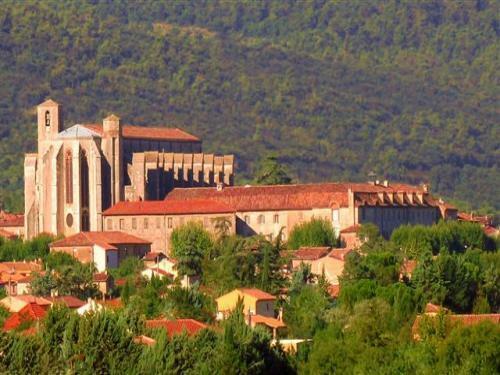 The following three nights are spent in Saint Maximin le St Baume. The town is situated around the magnificent Mary Magdalene Basilica and convent which is now a hotel in which we will stay, right next door to the Basilica. The Basilica contains the skull relic of Mary Magdalene which is on display once a year on her feast day in June. 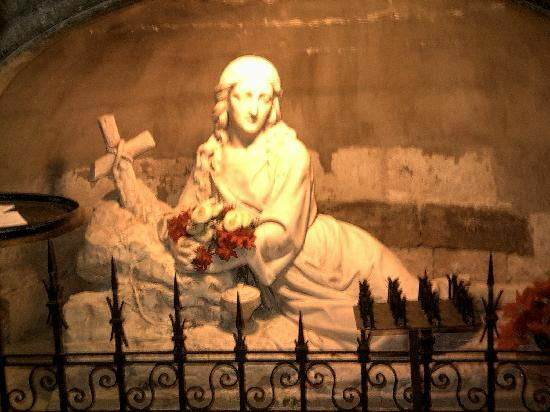 You will be able to visit the Basilica and Mary Magdalene crypt more than once and also to spend time there in prayer and meditation. From here we will undertake a day visit to the grotto where Mary Magdalene spent the last thirty years of her life. We will hike to the grotto where a daily mass is held. It is a bit of a steep walk up the side of the mountain, but it has carved steps and the walk is done as a ritual and a sacred pilgrimage, so no rushing! We will drink water from the sacred spring in the Sanctuary of Mary Magdalene. We will have lunch at the Monastery. and Joseph and the Holy Family at Cotignac. We will enjoy lunch at the sanctuary. monastery by Bernard of Clairvaux in the 12th century. 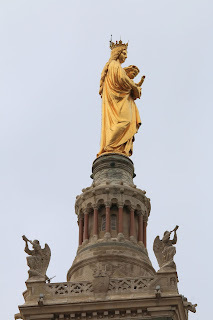 St Bernard had a special devotion to the Virgin Mary, and he would later write several works about the Queen of Heaven. emerged in the 12th and 13th centuries. stories of Mary Magdalene! This region is known as Our Lady of the Blue Apples. some which are only known to the locals. and participate in the Rosary procession dedicated to Mary, Our Lady of Lourdes. the procession together as pilgrims and priestesses. back to Marseilles by transfer with our guide and driver, depending on your own travel arrangements. Should you wish to stay longer in Lourdes, I can arrange for your room to be available for a few more days. will be up on this website on 1 June 2108 when bookings will open. The focus of this pilgrimage is the Cosmic Mother in the three aspects of Mary, Mary Magdalene and the Black Madonna and an immersion in the mysteries of the Great Mother. Time will be spent immersing ourselves in the sacred energies as pilgrims on these ancient paths; a daily meditation circle and tarot work, tarot journalling, ritual, visiting the reliquaries, creating your own tarot card and collage, participating in the nightly light rosary procession at Lourdes, drinking of the sacred waters of the miracle spring at Lourdes, visiting the Basilica and enough personal time to soak it all up and to look after the sensual pleasures of life, such as market scavenging, eating local food and time to rest and integrate. on my blog Cloister of the Heart. Each morning will start with a sacred circle of focus and intent; We will work with the Mysteries of Mary tarot deck in a deep and healing way - discussions will be personalised for you and for your own focus for the pilgrimage and spiritual journey. Each pilgrim will receive a specially created tarot journal and images for the pilgrimage. You will have time to journal and collage your entire pilgrimage and all work done with the tarot. A workshop in which you will create your own personal tarot card compiled of insights and experiences during the pilgrimage. 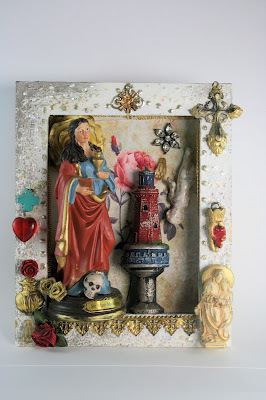 Since planning these pilgrimages I have been creating the Amulets of Mary Blessing and healing sets based on the story of Lourdes, Santa Sara and Mary Magdalene. I will include these into the daily sessions and I will share my insights and teachings on these ancient systems with you. * sheets of images and small items for your own tarot collage and tarot journalling - we will scavenge the village brocantes for additional material and visit the shops at the sacred sites for holy medals, etc. Final dates, details and prices will follow in due course.